These Almond Shortbreads are a nice cookie to have on hand. I often serve them in the afternoon with a hot cup of tea or for dessert, alongside a bowl of ice cream or a velvety smooth chocolate mousse. They have a sandy texture and subtle almond flavor which comes from adding ground almonds (almond flour or meal) to the batter. For this shortbread we are not making individual cookies, instead we are making one large round which can be cut into wedge-shape pieces after baking. These wedge-shaped shortbreads are also known as "petticoat tails", named after the bell-hoop petticoats worn by court ladies in the 12th century. Now, whenever you cut a round of shortbread into wedges there is the problem of the tips of the shortbreads breaking off. Dorothy Hartley in her lovely book "Food in England" tells us that "Every cook knows how the pointed ends of cut cakes and biscuits break off - so, after several centuries of broken tips, someone evolved the cure: they cut a circle out of the centre before baking......". If you like you can follow Dorothy Hartley's advice and cut out the center before baking, or, I like to think of those little pieces as the 'cook's treat'. The one ingredient in this shortbread recipe that you may not be familiar with is rice flour. Rice flour is a fine gluten-free flour produced from white or brown rice. If possible, I like to use brown rice flour. It can be found in some grocery stores or else health food stores or, again, it can be ordered online at www.bakerscatalogue.com. If you cannot find it just substitute regular cornstarch (corn flour) for the rice flour. Almond Shortbreads: Preheat your oven to 300 degrees F (150 degrees C). You will need an 8 inch (20 cm) tart pan with a removable bottom. In the bowl of your electric mixer (or with a hand mixer), beat the butter and sugar until smooth and creamy. Beat in the vanilla extract. Scrape down the sides and bottom of your bowl as needed. In a separate bowl whisk together the flours (all purpose, almond, and rice) and salt. Add this mixture to the butter and sugar mixture and beat just until incorporated. Press the shortbread dough evenly into your tart pan. Prick the surface of the shortbread with a fork to prevent the shortbread from puffing up. Using a sharp knife, score (make shallow lines) the top of the shortbread into 12 even pieces. 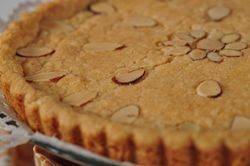 Gently press the flaked almonds in a decorative pattern on the top of the shortbread. Place in your preheated oven and bake until it is nicely browned (biscuit color), about 40 - 50 minutes. Place on a wire rack and allow the shortbread to cool for about five minutes before removing from tart pan. Place the shortbread round on a cutting board and cut into 12 wedges. Store in an airtight container or the shortbreads can be frozen.